Tom Clarke relished the physical battle of facing Stoke but was disappointed Preston North End didn’t come away with all three points. ALSO READ: How they rated - Who impressed for Preston North End in their draw with Stoke City? 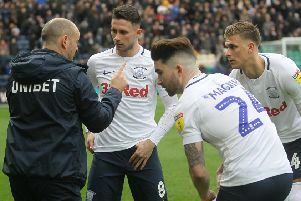 The Lilywhites captain had to handle the threat posed by first Benik Afobe and then Peter Crouch in the 2-2 draw at Deepdale on Saturday. It was a challenge that is Clarke’s bread and butter but the 30-year-old was frustrated to see PNE lead twice only to come away with just a point, Crouch scoring the second equaliser just after the hour mark. “I enjoy that physical contact,” said Clarke. “You know coming into the game that’s what it’s going to be. “With Afobe, he’s good in the air and has got a good leap. He’s physical but he’s also got that pace in behind as well. “Me and Ben Davies had to be on it and focused and then when you look to the side and Crouch is coming on you know you’re going to be in for another battle and that’s what it was. “He showed towards the end how effective he is. North End took the lead from the penalty spot through Paul Gallagher after Tom Edwards had been penalised for handball five minutes before the break. Erik Pieters replied almost immediately with a fine finish for the Potters but there was still time for a third goal of the opening period with Graham Burke scoring deep into stoppage time with an expertly controlled volley. It was Stoke who scored the only goal of the second half however with Joe Allen’s free-kick hitting Crouch on the back and looping in. “One thing that’s disappointing is that we scored at good times,” said Clarke. “With the first one we conceded straight after and then Burkey’s goal came right on half-time and it’s just disappointing that we couldn’t kick on. “We’ll look back at the goals but we can be proud of our performance. “They play up to their front men quite quickly and play for second balls. “I felt we tried to play the right way and thought we did very well and backed it up. “We’ve got young lads who get around the pitch really well and I think it showed.